Matthew Tkachuk scored 31st and 32nd goals in piling up his first career five-point game on Friday to lead the Calgary Flames to a 5-1 victory over the New York Rangers. Matthew Tkachuk'splaymaking ability was on full display on Friday night as he earned his first-career five-point game. 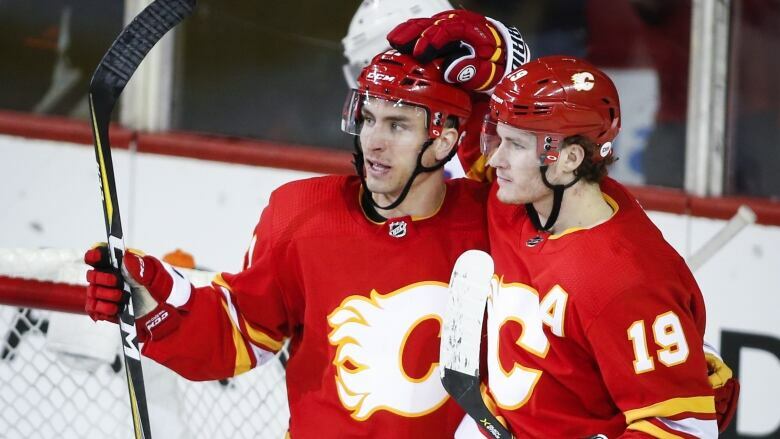 Tkachuk scored his 31st and 32nd goals and all three of his assists were primary helpers to lead the Calgary Flames to a 5-1 victory over the New York Rangers. Tkachuk had 10 points (six goals, four assists) on the Flames' perfect 3-0-0 homestand that moved Calgary back into first in the Pacific Division ahead of San Jose. "Obviously when I have the puck on my stick and guys are going to the net, I want to make plays," said Tkachuk, who was also a plus-five. "I don't think of myself as a shooter or a passer, I'm just somebody trying to read the play and make the best play possible." His play that had everyone talking was his set-up to Johnny Gaudreau 10 minutes into the game to open the scoring. Looking more like a football quarterback, Tkachuk came out from behind the net and from just past the goal line, lobbed a long, high pass into the air that one-hopped right to Gaudreau at the Rangers blueline, springing him on a breakaway that he neatly finished for his team-leading 34th goal. "I saw Johnny flying and I saw the (defence) and they weren't looking at me, so if I threw it up in the air, it's not like he can turn around, catch it and come back, so I just thought, it's better that (I) rip it hard and see if it goes past him," Tkachuk said. "It was such a fortunate bounce, it just landed and stopped. Johnny went in and made an unbelievable move." Flames coach Bill Peters says Tkachuk is a playmaker. "He makes subtle, little smart plays, plays off the wall, plays where he protects it and uses his body to protect the puck, he's smart," said Peters. "Just a real smart and instinctive player, but a lot of it is just the way he goes about the game. He's a student of the game and he looks to get better each and every time he goes on the ice." The hot streak comes after an extended cold stretch in which he had just six points in the previous 18 games. Calgary moves one point ahead of the Sharks with 11 games to go each. The Flames also lead the Western Conference, nine points up on the Winnipeg Jets, who they play on Saturday night. They'll be without Sean Monahan, who will not make the trip. He left the game after one period due to illness. Garnet Hathaway also scored for Calgary (44-20-7). Neal Pionk scored for the New York (28-30-13). The Rangers wrap up a four-game road trip (0-1-2) in Minnesota on Saturday. "They were moving the puck around smart. They had some guys that were making some really nice plays and we just didn't have an answer for it," said New York defenceman Marc Staal. "It's hard in those situations to not let it snowball. I thought we got down and couldn't get anything going after that." Tied 1-1 after 20 minutes, Tkachuk gave the Flames the lead for good 2:56 into the second when he deflected Mark Giordano's point shot past Alexandar Georgiev. Just over a minute later, Tkachuk earned his 100th career assist, setting up Hathaway in front to make it 3-1. It was all the offensive support needed by David Rittich, who turned aside 24 shots to improve to 25-7-5. Georgiev made 27 saves to fall to 10-12-3. New York coach David Quinn was not pleased with his club's effort. "We've been a team that has played hard but big deal. You should play hard in the National Hockey League. You're a professional athlete. You shouldn't get patted on the back because you played hard. It should be expected. We didn't play hard tonight. We certainly didn't play smart tonight."